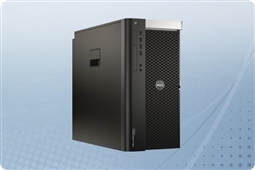 The Precision T7610 offers substantial compute performance for financial and scientific analysis, professional engineering and complex 3D modeling, and is the perfect end user solution to support even the most data and graphics intensive workloads. Dell workstations are tailored to your needs and offer a wide range of configurations that are ISV certified for a broad range of professional applications, so you can rest easy knowing your professional-grade system can handle your specific workload. The T7610 supports dual Intel Xeon E5-2600 product family processors for up to 2.9GHz Eight-Core 20MB processing power. These systems will support up to 512GB of PC3-12800 1600MHz DDR3 memory across 16 DIMM slots. Aventis Systems carries the Precision T7610 with four 3.5” SATA hard disk drives, solid state drives, or hybrid drive options for a max capacity of 16TB. These systems offer one external slimline optical bay, one external 5.25” bay, and four 3.5” front accessible hard drive bays. Get maximum power and performance with our Precision T7600 workstations below!